34dB – Highest NRR ear defenders for shooting, sports events, concerts, festivals, fireworks. COMPACT – Portable size for for efficient storage, the must- have for ear protection. ADJUSTABLE - Design adjustment headband of the earmuffs for a perfect fit from kid to adults. LOOKED AT SEVERAL OF THESE HEAD SETS! ONES SOLD HERE! 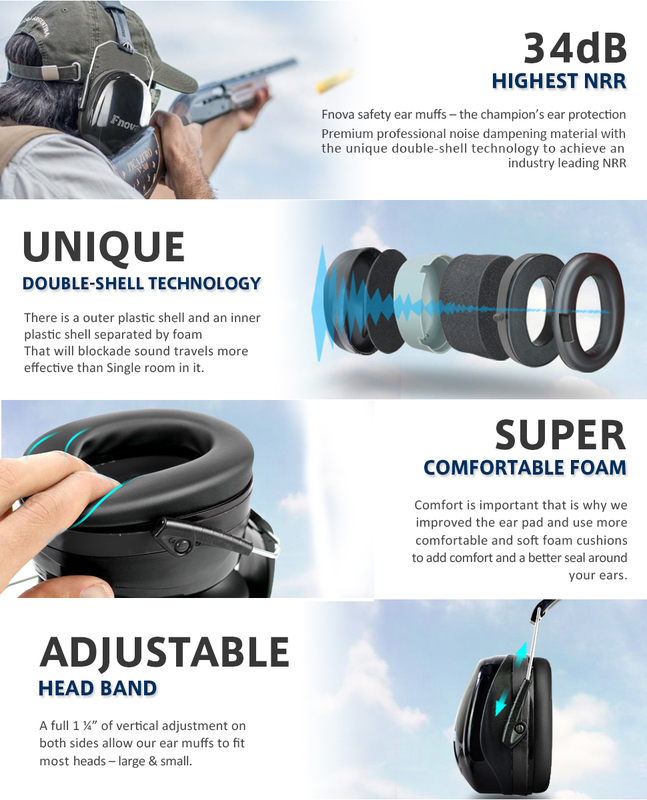 YES, your search for the perfect safety ear muffss is over, When you purchase the Fnova safety ear mufss NOW, means you get the best ear protection . The fnova ear muff not only offers the best de-noising effect, the comfortable feeling, pocket-size storage too! Of course you can adjust the size to fit almost size include kids', but we don't suggest child under 3 years old wear it. Why the fnova safety ear muffs can achieve the 34dB highest NRR ? Experts noted that: NRR depends on 3 factors( the sound absorption material、the sealing and the manufacturing techniques ). and the unique double-shell technology that blockade sound travels by built-in double room. All combine to built an industry leading 34dB NRR. What’s the Fnova ear muffs offers? - COMFORTABLE - Padded Head Band and Swivel cups design lined with Soft, comfortable Foam cushions providing non-stop comfort for hours around your head and ears..
- ADJUSTABLE - Design adjustment headband to achieve a full of vertical adjustment for a perfect fit. - PORTABLE - Compact, Standard Folding head band add more convenience to carry and store. - FASHIONABLE -Attractive, modern and stylish design with rounded, glossy ABS cup shells. - DURABLE - Industrial grade premium quality surly meets professional high quality standard to achieve the perfect combination of durability and comfort to withstand a lifetime of repeated use . do they sell a version that connects to hard hats? Sorry currently we don't sell that type of ear muffs which can connect to hard hats. The box mentions a replaceable hygiene kit consisting of 2 damping pads and snap in type air cushions. Anyone know where to find this kit? We sincerely apologize to you for the mistake on our box. Actually, there's no hygiene kit. Sorry for the confusion. We'll correct the mistake soon. Noise cancelling headphones? Docthey require batteries? No they do not require batteries. will they interfere with glasses? I think it depends. I have thin wire earpieces and it does not interfere. If you have thick plastic earpieces, it might. Would these be comfortable enough for sleeping? Block out voices and snoring? If you move any during the night, you would probably knock them off. Foam type ear plugs probably would be better to sleep in. These ear muffs were designed for shooting - not sleeping. Will these block out speech? I'd like to block out loud talkers outside my apartment, along with loud cars (mufflers and music) etc. Probably 95% or so. Talkers outside your apartment, yes. The over-amplified thump-thump is as much of a percussion as a sound. Percussion will still hit you, while actual sound should be mostly eliminated. I bought 3 pairs for shooting and mowing (field tractor). Entire family loves them. Are these earmufffs made in America? Our ear muffs are made in one of the best factories in China that specializes in manufacturing personal protection equippment. They're of good quality and quite effective. As you can see, we've earned good reputation(4.7 stars). They can block most noise from ever reaching your ears by the design. It means reducing the noise to a safety level and protect your ears. You can use them for shooting or construction work and so on. Would these fit a 6 year child ? Yes, they will fit almost all people, from children to adult. You can adjust them to the size of the child's head. Do these easily fit over a hard hat? Sorry it's inapplicable, the head band is not long enough to allow the ear muffs to be mounted over a hard hat. These work awesome and the price is great! I LOOKED AT SEVERAL OF THESE HEAD SETS including the Clear Amour ones sold here. I have a degree in engineering so i know a little about sound waves and how they travel. Foam is actually not a great way to block sound but a room inside a room is the best way. Thats how expensive recording studios are built. That is basically how these work ....... they have the outer plastic shell and an inner plastic shell separated by foam. Great design!It is unlikely that you can build anything much better because at some point the sound just travels thru your bones. You can cover your ears all you want but you will still hear some sound.I use these for shooting at the range and I am very happy with my purchase especially considering the low price! I read a couple of reviews that stated these ear muffs were a bit snug. I have a pretty good sized head, and I can tell you that as long as you adjust them properly, they fit fine. They are a bit snug, but the padding on the ear pieces is quite adequate if placed over the ear, and the snug fit is part of what allows this set to provide the 34dB of noise reduction. I have two older pairs of ear protection, one from 3M and the other from Stihl, and I can tell you that these are definitely better at blocking out noise. The others are only rated for 25 dB reduction, and I can notice the difference, and they were less expensive than the others. I wear them using my zero-turn mower and the power lawn stuff, like a weed wacker, hedge trimmer, chain saw, and other manly toys! They work great, and if I wear them in the house, I can't even hear my wife yelling at me to take out the trash!! I bought these to use while doing yard work. Lawn mowers, leaf blowers, trimmers, and other power equipment make a lot of noise. The length of time you are exposed to this constant noise is not good for your hearing. It seemed when I was reading reviews that most were using these while shooting firearms. I did see that the product description did say they were good for other noise sources, including lawn equipment.I can say after using them for several weeks that they work WONDERFULLY to block the noise from power equipment. They're very comfortable to wear. I would think that in any situation that you would want to reduce noise exposure these ear muffs would be the perfect choice. These are downright fantastic ear muffs! No exaggeration, these are the nicest ear muffs I have used. I have been using earmuffs for shooting for at least 20 years.I love how securely these press over my ears. This helps immensely in reducing noise. I didn't realize just how much more sound is blocked out with a well-fitting pair of ear muffs until I tried these.They are very comfortable to have on, I didn't notice any pain or strain after extended use.The construction is very good. They feel sturdy and strong. It takes just enough force to adjust the size to assure you that it isn't going to loosen up on it's own while wearing. The pads are very soft. These fold up very tightly and securely, making it easy to fit into your ammo box, drawer, or wherever you keep your ear muffs.I would 100% recommend these to anyone looking for a quality pair of ear muffs, whether it be for shooting, operating loud machinery, or whatever. Simply a great product, which is evident by the number of positive reviews! I received this product at a discounted rate in exchange for my review, but I did not commit to providing a review of any particular tone or rating. This review is honest and reflects my personal experience with this product.Thank you! If this review was helpful to you in any way, please click so below! WOW!!!! LIKE REALLY WOW! I'm a big guy with a big head over 7 3/4. These fit perfectly. And I literally ordered them in afternoon and next day 4pm they were delivered to my door. Absolutely thrilled at their service, product quality, and price. Great job Fnova. Seem to work very well. Seem to work very well.This is my first set of hearing protectors (other than ear plugs) so I don't have much to compare it to. I know that when I put these on, it is like my hearing has been nearly completely shut off. I bought these for the gun range but haven't been yet. And the price of about $15 is amazing.I think they're pretty sharp looking too and seemed comfortable for the 5 minutes I wore them. I am a tactical range instructor and these allow me to do my two hour classes without the need to take breaks to go outside to rest my ears. No more headaches from the noise of constant gun blasts. I now give this product link to all my students. Headband isn't actually adjustable. They worked in a hurry and using them with earplugs, they muffled the sound of 400 shots fired sufficiently, while still letting through yelled commands. So they work for that. But try adding on eye protection and a head cover, and they become awkward and uncomfortable. I won’t request a refund, just that you change the description where it is says “headband adjustable”.